He looks like a typical 13 year old with his rugged jeans and sturdy backpack, but how typical it is to spend all your childhood free time voluntarily chasing after goats and dreaming of owning your own cows? 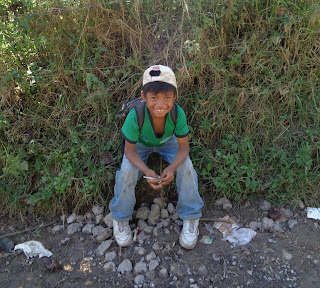 Diego lives in the small town (less than 2,000 people) of Rio Azul, Guatemala. Every day, he walks the 20 minutes to school and back home. For many Canadian kids, that might seem a little far, but Diego doesn't mind; he wants to learn and get smart so he can make his dreams a reality. What's he dreaming about? Diego says one of his dreams is to be "a great rancher" - he's been practicing on two goats for the past two years. When school lets out for the day, Diego heads to the countryside to graze his goats. He dreams of selling them someday to buy cattle. Thanks to his school lunch program supported by FH's Soup for Kids initiative, Diego is getting the nutrients he needs to keep dreaming big. Join us in sending soup to Guatemala so more kids like Diego can chase their dreams.